The new Chroma 62000B series of Modular DC Power Supplies offer many unique features for Burn-in and plating applications. The features include a N+1 redundancy, high power densities, hot-swappable maintenance, remote ON/OFF and programmable control via the CAN bus. The 62000B mainframe can contain up to 5 different modules ranging from 1.5 KW per module up to 120 KW, 2000 A and 150 V per system. 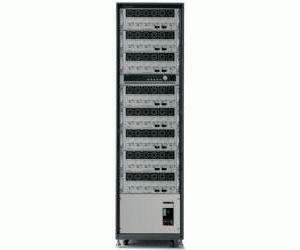 Two models are available - a three position or an six position mainframe. The 62000B is controllable via the CAN bus making them ideal for bulk power applications. Modern power factor correction circuitry is incorporated in the 62000B providing an input power factor above 0.98 to meet the IEC requirements. This PFC correction circuity not only reduces the input current but also raises the operating efficiency to over 80%. Optional graphic SoftPanels and CAN bus control allow for control and monitoring of the power system using an easy to use graphical interface.